The Cornerstone 100 Straightface product combines ease of installation, flexibility in use and durability into one great product. 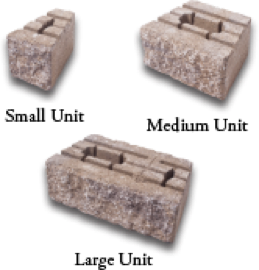 Used to create a wide range of attractive, sound and environmentally friendly retaining walls – from residential landscaping and large commercial projects – the CornerStone® 100 unit has a hollow core, allowing for less required man-power to install, transportation & production. 1.5 sf for 3 pieces combined. 30 sf/pallet for single sided / 26 sf double sided. StoneLedge™ is about more than retention. Rather, it’s about creating free standing walls that are beautiful, lending itself to creating stunning landscapes. Created as a multi-sized, double sided, tapered unit, this system possess the hand finished look of quarried stone, perfect for creative residential or commercial projects. 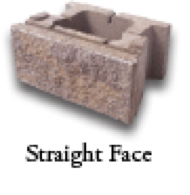 Designed to add the elegance of natural stone to your yard, StoneLedge™ can be used for a variety of applications including retaining walls, stairs, planters, fire pits or fireplaces, and terraced patios. The sheer flexibility of this product allows for endless creative patterns, helping you to create a truly unique design.